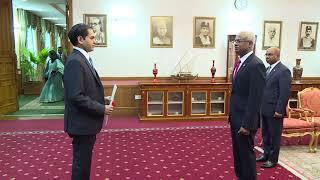 The newly appointed Ambassador of India to the Maldives, His Excellency Sunjay Sudhir, presented his credentials to His Excellency, President Ibrahim Mohamed Solih, this afternoon at the President’s Office. The President welcomed the new Ambassador to the Maldives and congratulated him on his new appointment, following which, the two discussed ways to take bilateral relations forward. The President stressed the high esteem with which the Maldivian government has always held India, and expressed his Government’s eagerness to collaborate with them on important bilateral, regional and international issues. 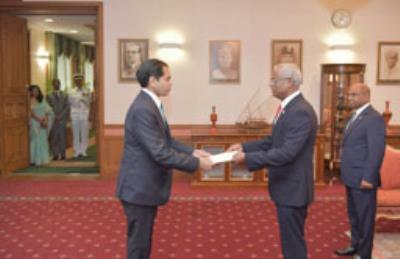 He further conveyed his warmest regards and well wishes to the Government and people of India. Ambassador Sudhir reciprocated the President’s warm sentiments and reiterated the high priority that the Indian government accords to maintaining the historically friendly relations between our two countries, and further expressed an eagerness to continue working together on areas of mutual interest.